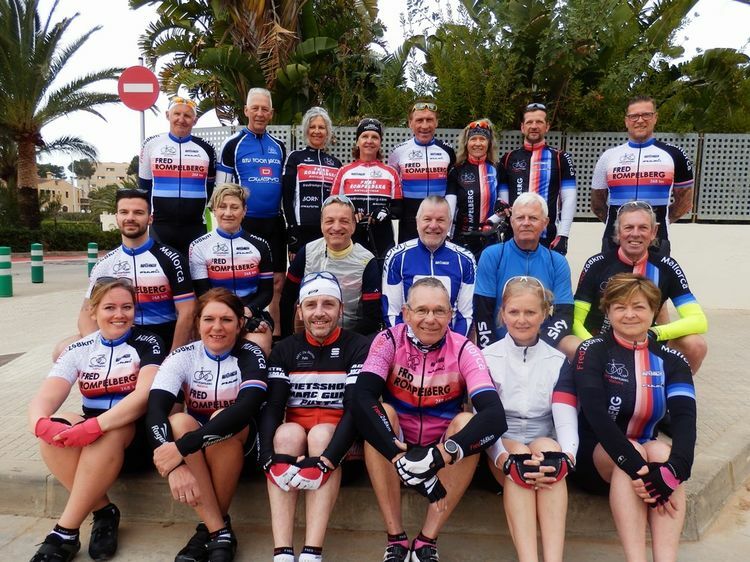 Laatste Nieuws over Fred Rompelberg Bicycling Team Mallorca >> Fred Rompelberg 268 km: Experience your cycling-holiday in June, July, August, September and October 2018 with us on Mallorca with Fred 268 km! Fred Rompelberg 268 km: Beleef nu uw fietsvakantie ook in juni, juli, augustus, september en oktober 2018 bij ons op Mallorca met Fred 268 km! Dit seizoen zal Fred Rompelberg ook fietsvakanties op Mallorca in de zomer organiseren. De groepsleiders en mecaniciens staan dan weer voor u klaar om u een fantastische fietsvakantie te bezorgen. De temperaturen zijn dan heerlijk warm. U kunt nu al boeken. We zijn op Mallorca van 2 februari tot en met 28 oktober 2018. Op dit moment hebben we al 20.8% meer boekingen dan vorig jaar. Geweldig toch! 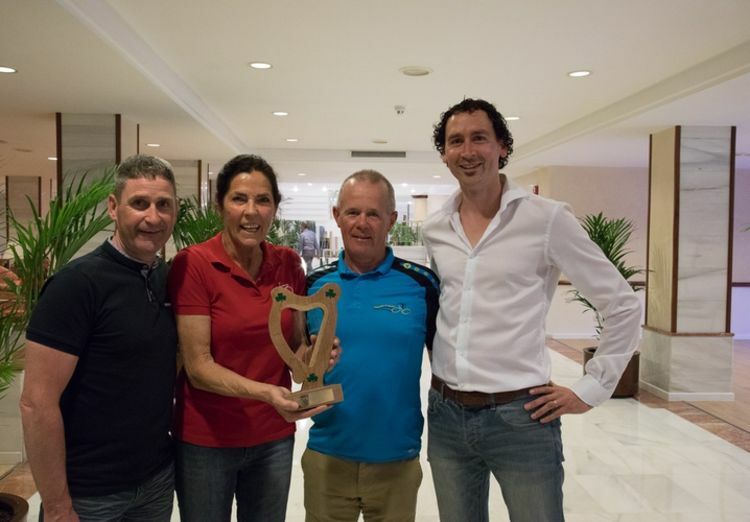 - Er waren afgelopen week 44 Ieren met organisator John Greene bij ons op Mallorca, ze waren dol enthousiast en zeiden dat ze nu alweer uitkeken naar het volgende jaar om weer naar Mallorca te komen naar het Fred Rompelberg Bicycle-Team. 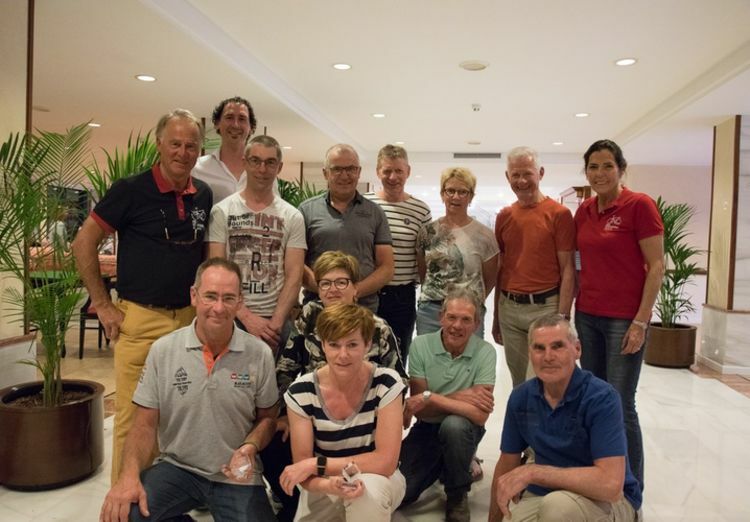 - Henk Hamers en zijn team waren voor de 16e keer bij ons op Mallorca. Henk en team nog vele jaren hopen we jullie te zien bij ons op Mallorca. Queen: Jolanda Kroot uit Middelbeers, Nederland met 552.08 km in 5 dagen. King: Peter van Elderen uit Middelbeers, Nederland met 699 km in 5 dagen. Zingende damesgroep Ieren, groepsleider Henk Huijskens. 13 zingende Ierse dames in de Cappuccinogroep kregen tijdens de fotosessie op dinsdag zelfs Fred stil! Martina Flynn uit Sligo, Ierland. Pascalle Rademacher uit Rotterdam, Nederland. Hallo, net terug van een week fietsvakantie bij Fred en zijn helpers. Geweldig. Verzorging en begeleiding super! We hebben ons de hele week als een prof gevoeld. We komen terug! Pascalle Rademacher uit Rotterdam, Nederland. Carmen Joskin uit Antwerpen, België. Pascalle en Carmin. Bedankt voor jullie leuke reactie! Fred Rompelberg 268 km: Erleben Sie Ihren Radurlaub im Juni, Juli, August, September und Oktober 2018 bei uns auf Mallorca mit Fred 268 km! In dieser Saison organisiert Fred Rompelberg im Sommer auch einen Fahrradurlaub auf Mallorca. Die Gruppenleiter und Mechaniker sind bereit, Ihnen einen fantastischen Fahrradurlaub zu bereiten. Die Temperaturen sind dann wunderbar warm. Sie können bereits jetzt buchen. Wir sind auf Mallorca vom 2. Februar bis 28. Oktober 2018. Zu diesem Zeitpunkt haben wir bereits 20,8% mehr Buchungen als im Vorjahr. Erstaunlich, richtig! Die zurückkehrenden Gäste sind alle sehr begeistert und stimmen zu, dass das Gesamtprodukt Mallorca Fred Rompelberg 268 km FORMIDABEL ist. ****Unsere Radsportferien sind für alle Radfahrer im Alter von 8 bis 88 Jahren. 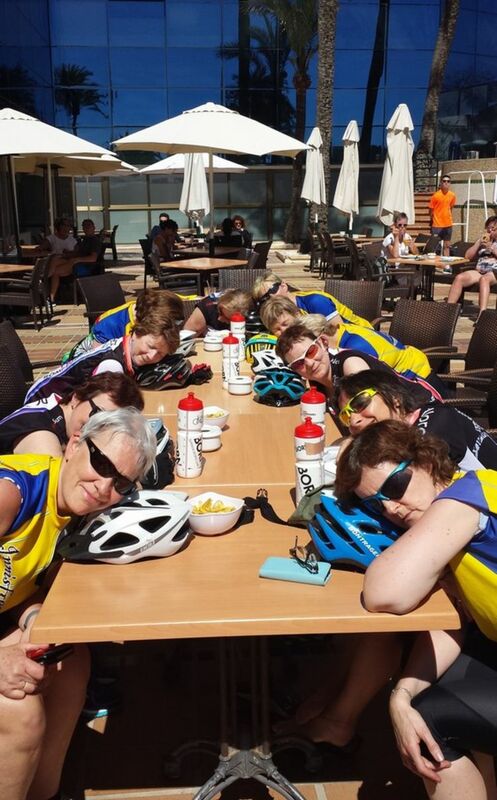 - Letzte Woche waren 44 Irländer mit Organisator John Greene bei uns auf Mallorca, sie waren sehr enthusiastisch und sagten, dass sie sich bereits auf das nächste Jahr freuen, um zurück nach Mallorca zum Fred Rompelberg Bicycle-Team zu kommen. - Henk Hamers und sein Team waren zum 16. Mal bei uns auf Mallorca. Henk und Team wir hoffen Euch noch vielen Jahren bei uns auf Mallorca zu sehen. Königin: Jolanda Kroot aus Middelbærs, Niederlande mit 552,08 km in 5 Tagen. König: Peter van Elderen aus Middelbeers, Niederlande mit 699 km in 5 Tagen. Singende Irischer Damengruppe mit Gruppenleiter Henk Huijskens. 13 singende Irische Damen in der Cappuccino Gruppe haben während dem Dienstag Fotoshoot sogar Fred zum schweigen gebracht! Martina Flynn aus Sligo, Irland. Pascalle Rademacher aus Rotterdam, Niederlande. Hallo, grade zurück von einer Woche Radurlaub bei Fred und seinem Helfer. Genial. Organisation und Begleitung waren super! Wir haben uns die ganze Woche wie professionelle Fahrer gefühlt. Wir kommen zurück. Pascalle Rademacher aus Rotterdam, Niederlande. Carmen Joskin aus Antwerpen, Belgien. Hallo Fred, ich wollte dich nur wissen lassen, dass ich eine tolle Zeit mit dem Fred Rompelberg Bicycle Team hatte! Besonderer Dank geht an die Mechaniker, die mir mit meinem eigenen Fahrrad geholfen haben. Alles ist sehr gut organisiert. Grüße, Carmen Joskin aus Antwerpen, Belgien. Pascalle und Carmen. Danke für Ihre positive Rückmeldung! This season, Fred Rompelberg will also organize cycling-holidays on Mallorca in the summer. 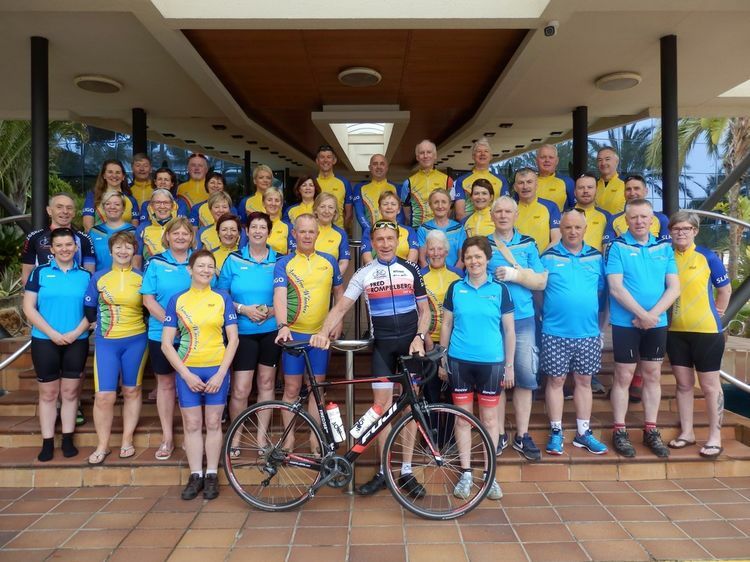 The group leaders and mechanics are ready to give you a fantastic cycling holiday. The temperatures are then wonderfully warm. You can already book now. We are on Mallorca from 2 February to 28 October 2018. At this moment we already have 20.8% more bookings than last year. Amazing, right! The guests returning home are all very enthusiastic and agree that the total product Mallorca Fred Rompelberg is 268 km FORMIDABEL. 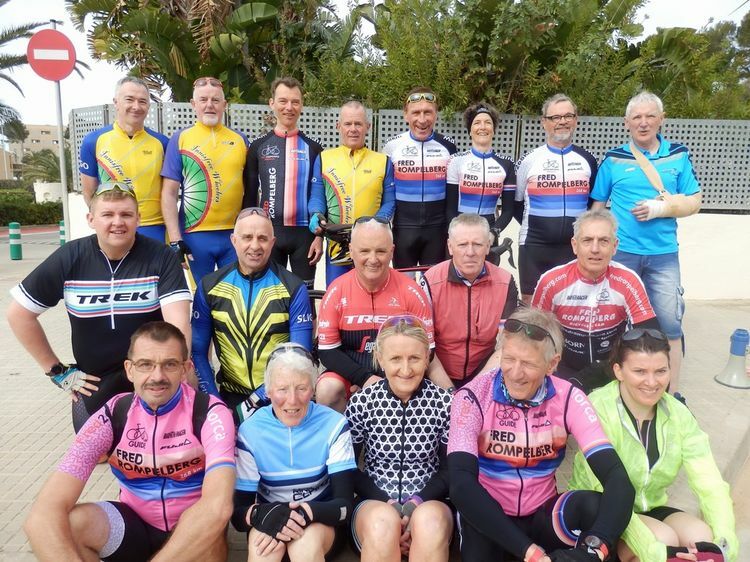 - Last week there were 44 Irishmen with organizer John Greene with us on Mallorca, they were very enthusiastic and said that they were already looking forward to the next year to come back to Mallorca to the Fred Rompelberg Bicycle-Team. 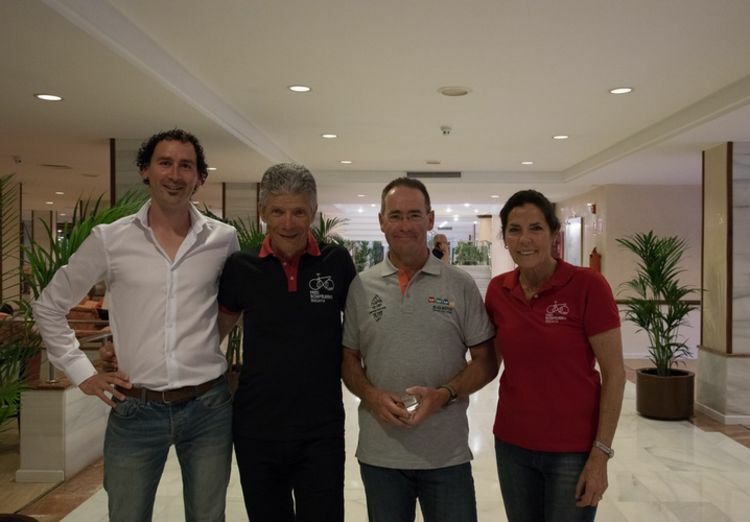 - Henk Hamers and his team were with us on Mallorca for the 16th time. 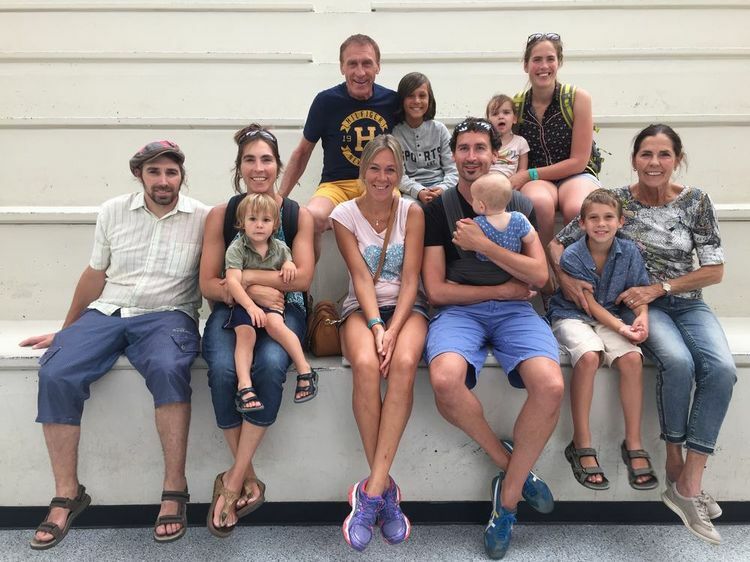 Henk and team for many years we hope to see you with us on Mallorca. 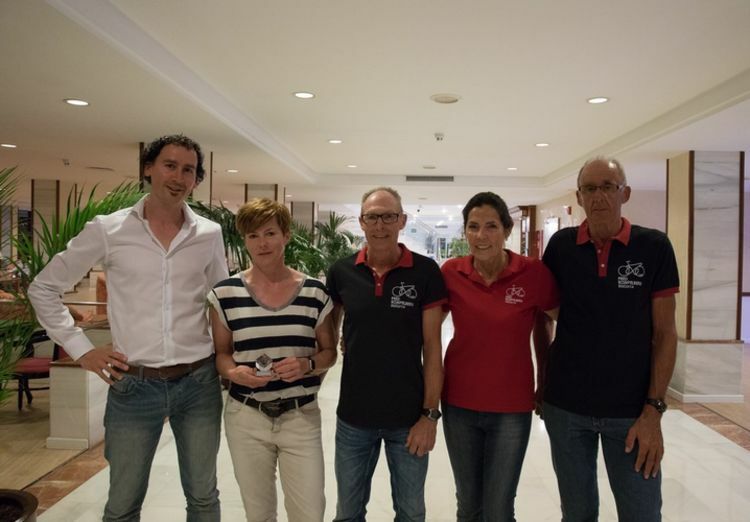 Queen: Jolanda Kroot from Middelbeers, The Netherlands with 552.08 km in 5 days. King: Peter van Elderen from Middelbeers, the Netherlands with 699 km in 5 days. Singing ladies from the Irish group with groupleader Henk Huijskens. 13 singing Irish ladies in the Cappuccino group actually shut up Fred for a moment during the Tuesday fotoshoot! Martina Flynn from Sligo, Ireland. Pascalle Rademacher from Rotterdam, The Netherlands. Hello, just back from a week cycling holiday with Fred and his helpers. Awesome. Care and guidance were super! We have felt like a pro for a week. We come back! Pascalle Rademacher from Rotterdam, the Netherlands. Carmen Joskin from Antwerp, Belgium. Hi Fred, I just wanted to let you know that I had a great time with the Fred Rompelberg Bicycle Team! Special thanks to the mechanics who helped me with my own bike. Everything is very well organized. Greetings, Carmen Joskin from Antwerp, Belgium. Pascalle and Carmin. Thanks for your nice reviews! In the Picture: Fred 268 km, Shayne Rompelberg, Mare Scholma, Letizia Rompelberg, Dany Fortin, Tiziana Rompelberg, Many, Anja Rompelberg, Jetse and Lieuwe Scholma, Jaël St-Louis and Tiny Rompelberg. 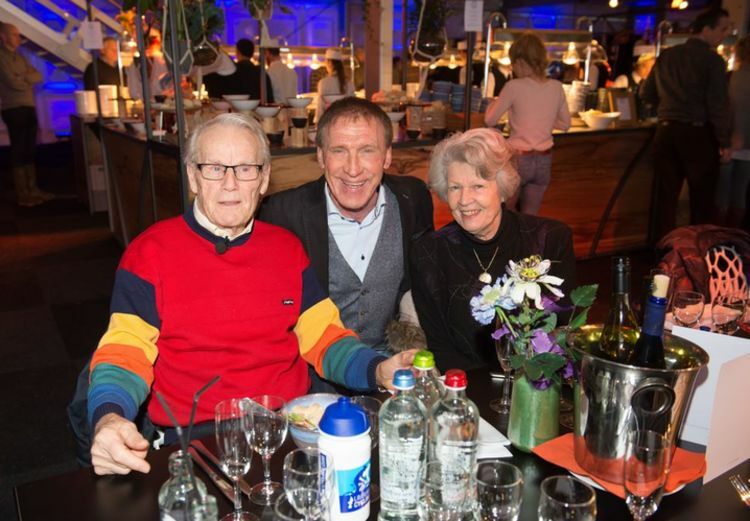 Tour de France winner Jan Janssen, Jan won in 1968 the Tour de France with his wife Cora and Fred 268 km. Maurice Graef, Tiny Ruys, Fred 268 km, Willie Boessen, Sef Vergoossen and Coocky Voorn. Good luck and we wish all of you many years to go in a good health. 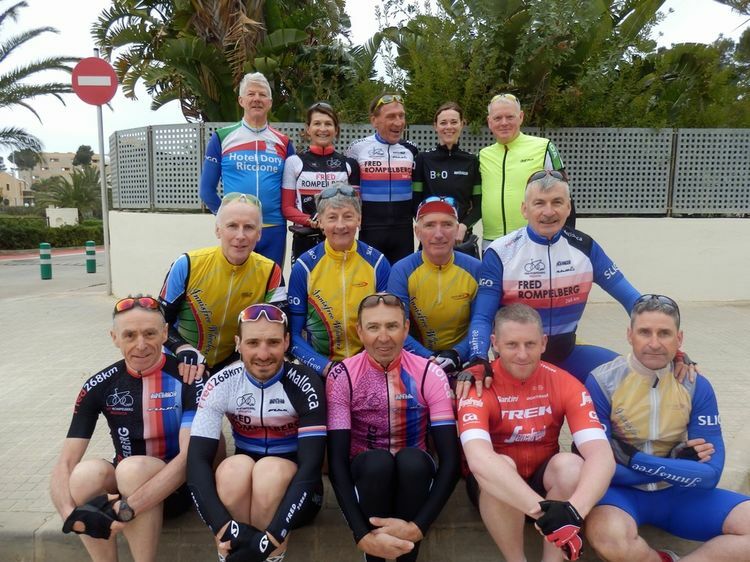 The group of John Greene from Ireland were with us on Mallorca to cycle with his guests on our cycling-paradise Mallorca. John and his group, we wish you all the best and hopefully till next year in a good health! Nicole O'Reilly, Noelle Molloy, Eileen Carr, Brid Howley, Monica Hopper, John Greene, Hugh Bennett, Tina Horton, Ger Delorey, Pam Scanon, Ann Gorby, Deirdre Murray, Eva Mulrooney, Eileen Curley, John Molloy, Siobhan Burke, John Delorey, Eithne Beirne, Ann-Marie Byrne, Uwa O'Boyle, Joe Curley, Niall Hopper, Joe Gethins, Matt Tunney, Eddie Carr, Pat Tighe, Dolores Greene, Ita Rooney, Rose Tully, Con Lee, Dave Flynn, Alan Kelly, Fred 268 km, Pam Benson, Ann Dolan, Martin O'Hara, Gary Rooney, Joe Dolan and Eileen Gillen. 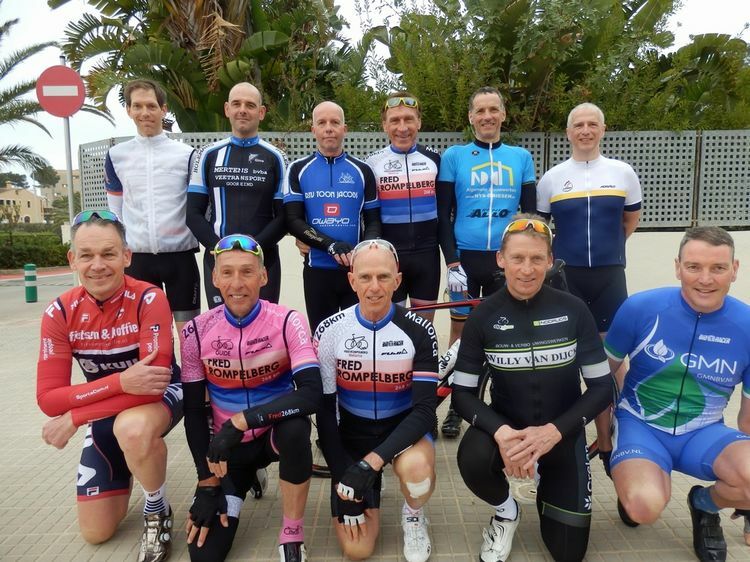 The group of our teamleader Henk Huijsken, ready to go with our hobby cyclists to make a nice tour on Mallorca. 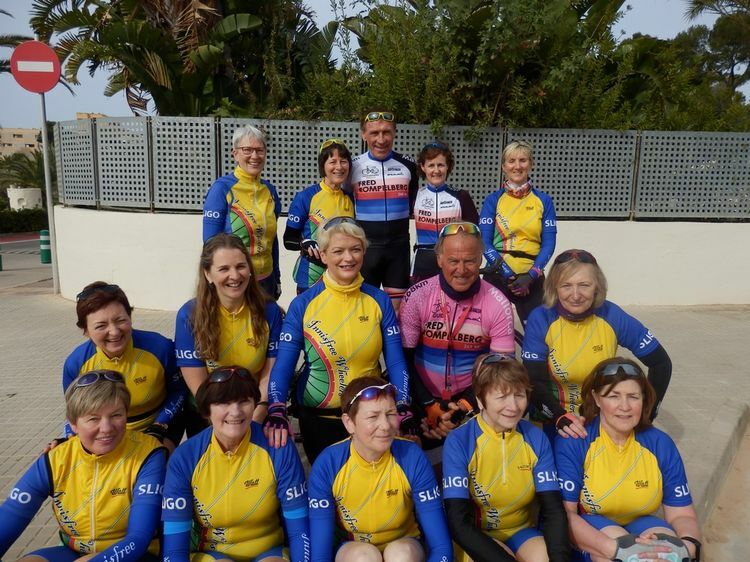 Geraldine Delorey, Eithne Byrne, Fred 268 km, Siophan Burke, Deirdre Murray, Ann Gorby, Eilleen Curley, Ann-Marie Byrne, Henk Huijskens, Eva Mullrooney, Pam Scanlon, Martina Flynn, Brid Howley, Noelle Molloy and Una O'Boyle. The group of Leonie Beekmans and Ad Vlemminx from the Netherlands. 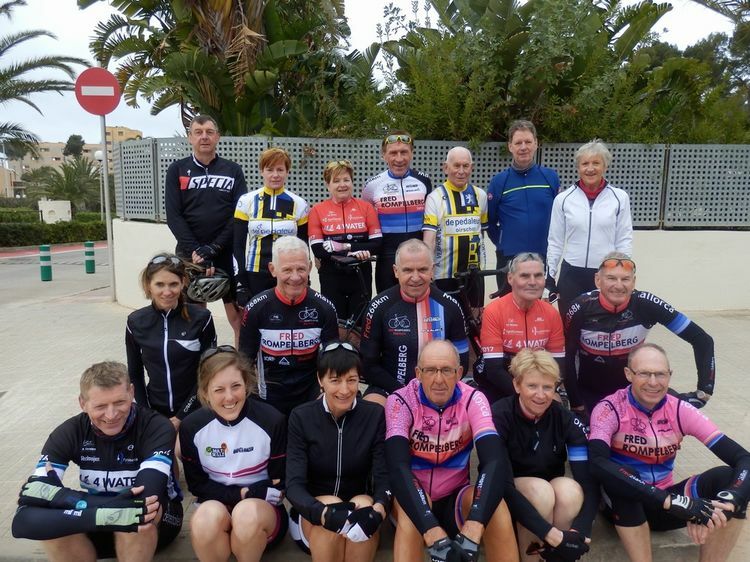 This group comes already many years to us to cycle on our cycling-paradise Mallorca. 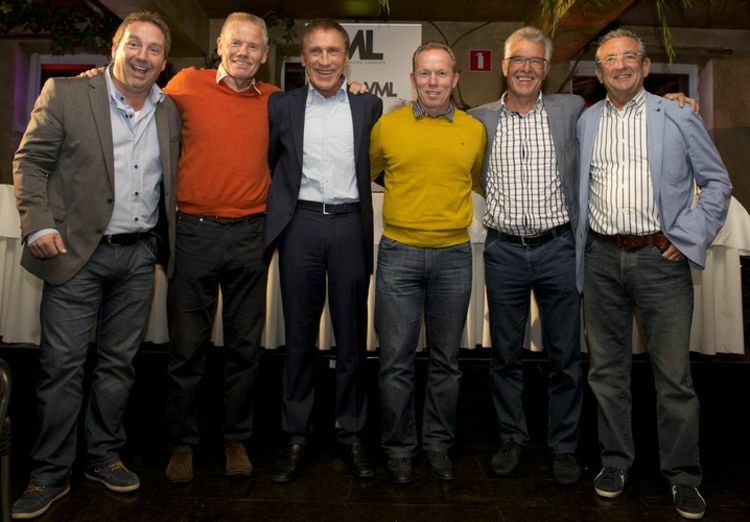 Leonie Beekmans, Ad Vlemminx, Toos Mutsaers, Piet Haest, Geert Schilders, Theodorus Van Kroonenburg, Marie-Anne Van Druenen, Peter Van Elderen, Ton van Liempt, Pieter Van Aaken, Cor Gerritsen, Lies Beekmans, Jolanda Kroot, Henk Huijskens, Jetse Scholma and Tiny Rompelberg. 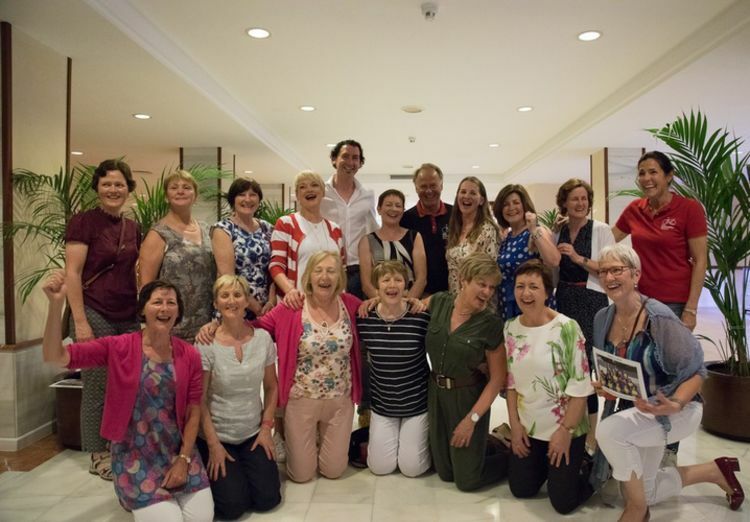 Special story of the week winner: Singing ladies from the Irish group with groupleader Henk Huijskens. Marc Michaux, Klaus Plessner, Letizia Rompelberg, Julian Plessner, Benjamin Taschner and Tiny Rompelberg. In the picture chairman Alan Kelly and organizer John Greene, Tiny Rompelberg and Jetse Scholma. 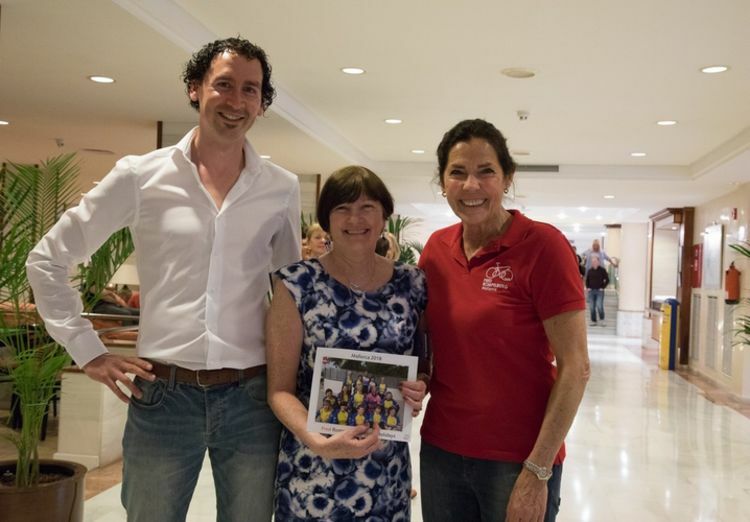 In gratitude for the wonderful week, the whole Irish team offered the Fred Rompelberg Bicycle-Team a gift which was received by Tiny Rompelberg. Our weeks king: Peter van Elderen from Middelbeers, the Netherlands with 699 km in 5 days. Jetse Scholma, Dany Schiettecatte, Peter van Elderen and Tiny Rompelberg. Photo compition week winner: Martina Flynn from Sligo, Ireland. Our weeks queen: Jolanda Kroot from Middelbeers, The Netherlands with 552.08 km in 5 days. Jetse Scholma, Jolanda Kroot, Eddy Bosch, Tiny Rompelberg and Jos Goyens. The group of Henk Hamers from the Netherlands. 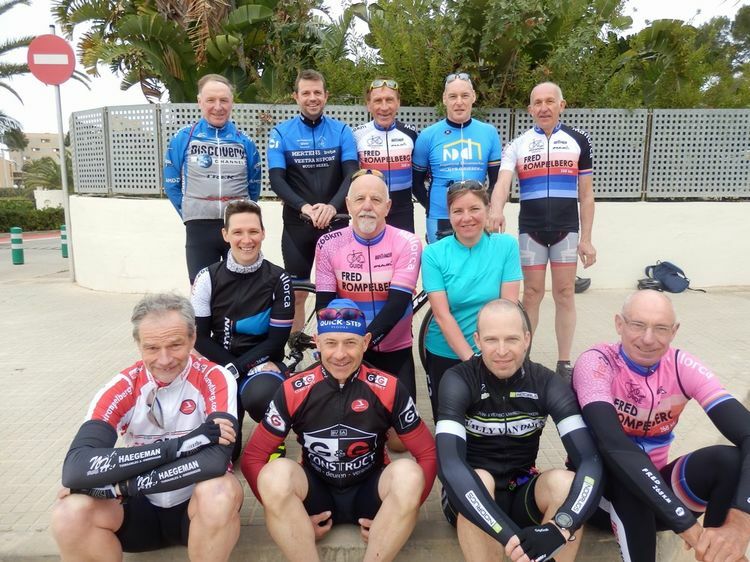 This group comes already 16 years to us to cycle on our cycling-paradise Mallorca. Adri Loose, Henk Lievens, Ger de Peijper, Fred 268 km, Fer Rompa, Niels Rasenberg, Marc de Peijper, Jan Pieter Simons, Henk Hamers, Wally de Ridder and Fred 268 km. The group of our teamleader Xavier Vanhaeren, ready to go with our hobby cyclists to make a nice tour on Mallorca. Michael Ibendahl, Bart Leynen, Henri Roelofs, Fred 268 km, Leo Nijs, Wim Chalmet, Bert van de Tunk, Xavier Vanhaeren, Johan Schut, Willy van Dijk and Gerard Top. The group of our teamleaders Galin Dimitrov and Robrecht Vranken, ready to go with our hobby cyclists to make a nice tour on Mallorca. Matt Tully, Rose Tully, Fred 268 km, Marije Joling, Eddie Carr, Joe Gethins, John Molloy, Paul Flynn, Con Lee, Hugh Bennett, Galin Dimitrov, Robrecht Vranken, Kevin Mc Morrow and Alan Kelly. The group of our teamleader Dany Schiettecatte, ready to go with our hobby cyclists to make a nice tour on Mallorca. Peter Elderen, Geert Schilders, Fred 268 km, Kris Vanderhauwaert, Bas Damme, Dany Schiettecatte, Paul Ehrhardt and Cor Gerrissen. The group of our teamleader Jur Jan Eissing, ready to go with our hobby cyclists to make a nice tour on Mallorca. Wim Lighthart, John van Halderen, Marga Taal, Christel Schulz, Fred 268 km, Katy Flement, Jens Bultinck, Andreas Graaf, Robert Moyson, Marianne Beldman, Andy Bourgonjon, Wim Grin, Henk Spigt, Friso ten Holf, Cher Moyson, Miranda Gosewehr, Carl Verdamme, Jur Jan Eissing, Hilde Leys and Lies Beelmans. The group of our teamleader Jeff van Bedts and Hans Klieverik, ready to go with our hobby cyclists to make a nice tour on Mallorca. 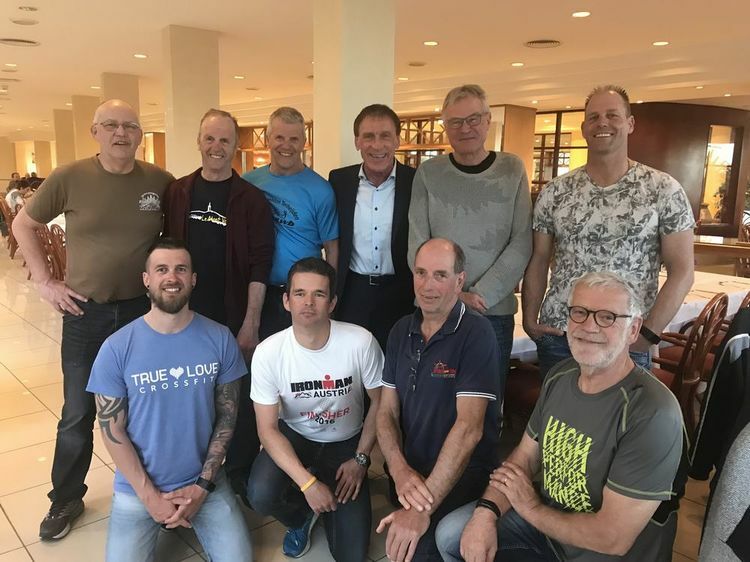 Pat Tighe, John Delorey, Tim Davmstadter, John Greene, Fred 268 km, Eva Wolf, Piet de Coninck, Martin O'Hara, Stephen Mc Cormick, Neill Hopper, Gary Rooney, Joe Dohan, Frank van Ammers, Jeff van Bedts, Pam Benson, Ita Rooney, Hans Klieverik and Nicola Reilly. 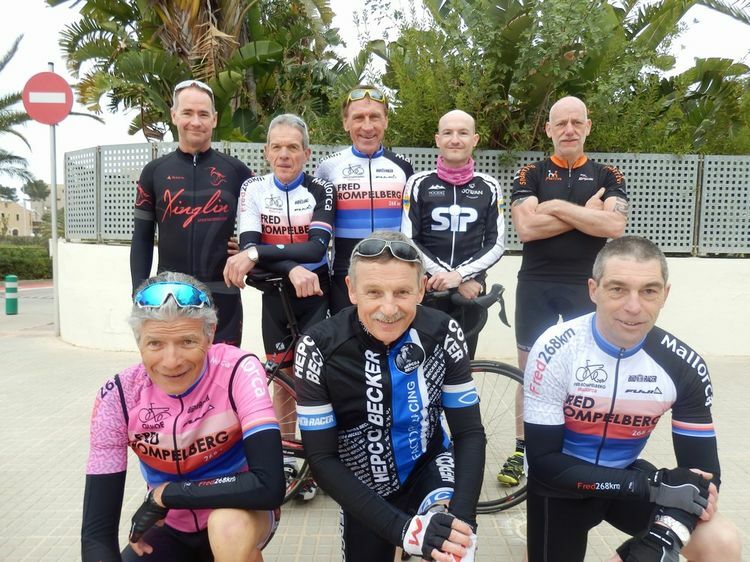 The group of our teamleader Lothar Steinfuhr, ready to go with our hobby cyclists to make a nice tour on Mallorca. Cor Dekker, Cees de Jong, Fred 268 km, Wynand van Leeuen, Anne Poel, Anton Wenzel, Dave Flynn, Lothar Steinfuhr and Joe Curley. The group of our teamleader Jos Goyens and Eddy Bosch, ready to go with our hobby cyclists to make a nice tour on Mallorca. Luc van Valckenborgh, Jolanda Kroot, Leonie van Kronnenburg, Fred 268 km, Ton van Liempt, Ronald Keus, Loes Nijssen, Cherryl Closener, Piet Haest, Ad Vlemminx, Pieter van Aaken, Frank Scheenstra, Theo van Kroonenburg, Kira Vandevoorde, Ann Lobbestael, Jos Goyens, Toos Vlemminx and Eddy Bosch. 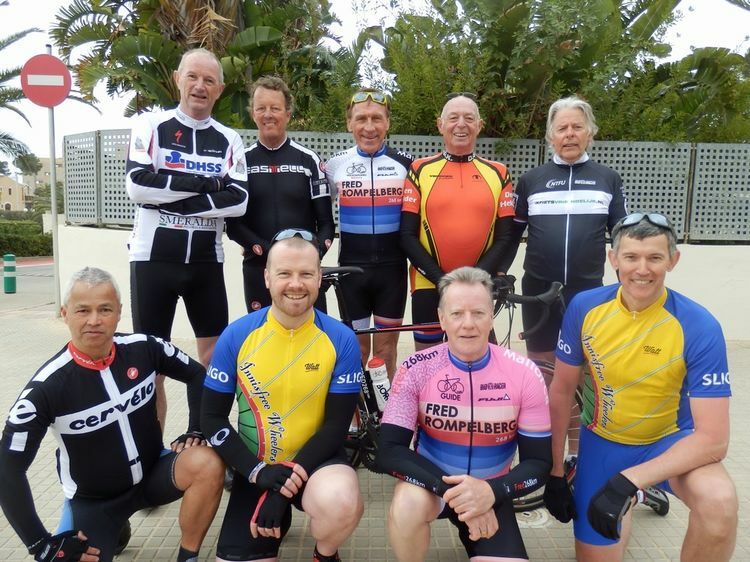 The group of our teamleader Willem Werkman and Wolfgang Faber, ready to go with our hobby cyclists to make a nice tour on Mallorca. Jozef van Damme, Steven Donckers, Fred 268 km, Patrick Peeters, Marc Geysen, Ann Henderickx, Willem Werkman, Wendy Geysen, Luc Vijverman, Dirk Gees, Steven Verlinden and Wolfgang Faber. Congratulations Martina Flynn, amazing photo!